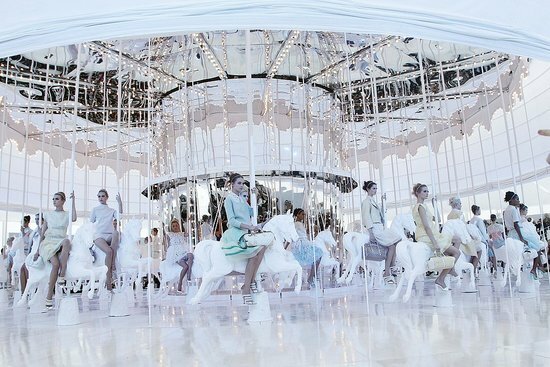 As the curtain rose on the Louis Vuitton SS’12 show, an enormous slow-turning white carousel was unveiled, complete with 48 gleaming white horses (one for each model), forming a heavenly constellation of prettiness. The designer behind the magical spectacle was Marc Jacobs, who had booked the biggest carousel in Paris to showcase his sugary sweet collection for Louis Vuitton. Inspired by his whimsical strolls through Paris’s Tuileries Gardens, where a traditional carousel spins every spring, his fairground fantasyland had every member of the front row gasping in awe. Models dismounted their horses one by one wearing sugared almond-coloured princess line dresses full of frothy femininity topped with dainty white headbands, with Kate Moss rounding off the show looking ethereal in a white feathered broderie anglaise dress.